SKF bearings are designed for high productivity, and also allow farmers to enjoy greater yields and reliability. 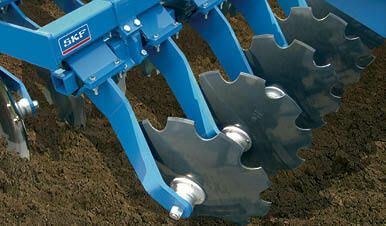 SKF understands what modern farmers need. The manufacturer discusses challenges and areas for improvement, and works closely with manufacturers of agricultural machinery to develop solutions for new applications. These solutions are then tested in laboratories and on farms. Through this approach, SKF has developed a range of products and services to help farmers meet the growing demands placed on the agricultural industry. Cylindrical roller bearings SKF, series NJ-22..